Endoscopic submucosal dissection (ESD) is the preferred treatment for esophageal squamous cell carcinoma (ESCC). However, ESD can be difficult when patients move due to insufficient sedation. We conducted a prospective confirmatory single arm study to evaluate the efficacy of using dexmedetomidine (DEX) in combination with midazolam as a novel sedation for ESD. Endoscopic submucosal dissection was performed without intubation in 65 patients. The primary outcome was the proportion of patients who did not move or require restraint during ESD, compared to historical control of ESD performed under midazolam sedation. 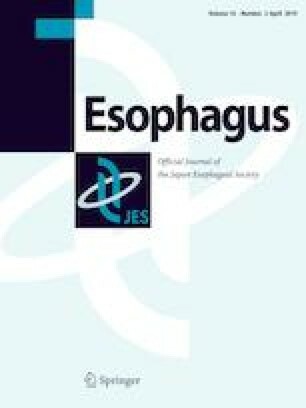 Secondary outcomes included the frequency of complications and self-report questionnaires from patients and endoscopists. Restraint was not required in 97% of patients sedated using the combination of DEX and midazolam. Depressed respiration, low blood pressure, and bradycardia occurred in 23, 37, and 26% of patients, respectively. All patients recovered without severe complication. Occurrence of low blood pressure and bradycardia were higher, while respiratory depression was lower for the combination group than for the historical control group. The amount of midazolam used was significantly lower than in the control. Of note, 94% of patients had no painful sensations, with 3 reporting chest pain and 3 having a recollection of the procedure. Endoscopists were satisfied with the sedation in 94% of cases. All lesions were resected in en bloc fashion, without perforation. The combination of DEX and midazolam provided effective sedation for ESD for ESCC. All procedures were in accordance with the ethical standards of the institutional IRB committee on human experimentation and with the Helsinki Declaration of 1964 and later versions. All authors declare no conflicts of interests. Informed consent for it was obtained from all patients for being included in the study.